Mansfield, 2 @ Attleboro, 0 – Final – Chris Elsner picked up his sixth assist of the season, finding Brad Eames for the opening goal just seven minutes into the game to give the Hornets the early lead. Cullin Anastasia doubled the Hornets’ lead just seconds before the halftime before off an assist from Jareme DiLirenzo. Michael Kirejczyk made five saves in net and got strong performances from Harry Braidt, Max Gurnon, Nick Hyland and Elsner in front of him. Canton, 1 @ Stoughton, 1 – Final – Freshman Fabio Ponce De Leon finished off a long throw in from Josh Mitchell in the first half but Canton freshman Paul Corcoran scored his first career goal to pull the Bulldogs level. Taunton, @ King Philip, 4 – Final – Tyler Mann scored the opening goal inside the first 10 minutes off an assist from Joe Kellett and then Mann returned the favor less than 10 minutes later, finding Kellett on a corner kick. Will Weir also scored a first half goal and Cam Mullins added a fourth for the Warriors early in the second half. Milford, 0 @ Oliver Ames, 2 – Final – Junior Thomas McCormick set up a goal in both the first and second halves to push OA to a key divisional win. McCormick assisted on Keegan Nutt’s goal in the first half and then McCormick set up Jack Sheldon in the second half. Attleboro, 1 @ Mansfield, 4 – Final – Alle Bezeau, Stephanie Kemp, Jen Kemp and Katie Bongarzone all scored second half goals to give Mansfield head coach Kevin Smith his 100th career victory. Paige Medeiros scored for Attleboro. Stoughton, 1 @ Canton, 6 – Final – The Bulldogs created a number of chances, according to coach Kate Howarth, and had five different players score goals in the win. Meaghan Hunter scored twice for Canton, which also got goals from Hannah Link, Riley Duserick, Sarah MacQuarrie, and Sarah Connelly. Stoughton’s goal was scored by Krista Michienzi off a cross from Mia Greene. Foxboro, 5 @ Sharon, 0 – Final – Riley Collins scored a hat trick for Foxboro and Hannah Burns and Hailey Maling each scored once. Oliver Ames, 3 @ Milford, 0 – Final – Oliver Ames jumped out to a 2-0 lead at halftime behind goals from junior Francesca Calabraro and senior Delaney Benton. Junior Kiana Lozzi added a second half goal for the Tigers. Milford head coach Jay Mastaj said Katie Brown, Kristen Franzini and Nichole Dahlgren played well for the Scarlet Hawks. Mansfield, 4 @ Attleboro, 1 – Final – Olivia Horn found the back of the net twice to pace Mansfield to a key divisional win over Attleboro. Caitlin Whitman and Brianna Puccia each scored once for the Hornets. Canton, 1 @ Stoughton, 2 – Final – Angela Connelly’s goal with 2:39 left in the game lifted Stoughton to its first win over Canton in over a decade. Mia Russell scored Stoughton’s first goal. Sharon, 0 @ Foxboro, 7 – Final – Annie McGeary scored a hat trick for the Warriors. North Attleboro, 0 @ Franklin, 5 – Final – Senior Samantha Jones made nine saves in net to get the shutout as Franklin bounced back from its first loss of the season. Freshman Annie Walsh scored a pair of goals while senior Kelsey McPhee, sophomore Christina Quinn and freshman Cassi Ronan each scored once. Taunton, 1 @ King Philip, 3 – Final – King Philip netted a pair of goals in the second half to break a 1-1 deadlock at halftime. Courtney Foley scored twice, one assisted by Christina Hathaway and one by Casie Curtin. Liz Furfari netted an unassisted goal for KP. Milford, 25 @ Canton, 30 – Final – Canton senior Mark Clancy broke the course record time, finishing in 16:08 to beat the old record by 13 seconds. Canton’s other finishes were sophomore Jack Healey in fourth (17:09), senior Courtland Priest in sixth (17:41) Thomas Cahill in ninth (18:04) and Andrew Salvatori in 11th (18:27). Attleboro, 50 @ King Philip, 15 – Final – King Philip took the first five spots in the race with sophomore Erin Quinn leading the way in 20:41. Erica Layne, Leia Quinn, Nicole Jutras and Brianna Aubin also finished in the top five. Milford, 34 @ Canton, 25 – Final – Canton’s Cat Song set a new course record (17:57), smashing the previous record (19:26) but nearly 90 seconds. Olivia Stevens finished fourth (22:13), Ally Chin finished fifth (22;21), Emily Orkin in seventh (22:35) and Margaret Polsgrove (22:54) in eighth. Milford, 104 @ Stoughton, 122 – Final (6 holes) – Ryan Tomaso, Anthony Arcudi, Riley Lynch and Tylor Renaud were the top four finishers for the Scarlet Hawks. Eoin Doherty was the top finish for Stoughton. Sharon, 176 @ Canton, 156 – Final – Junior Pat Duggan and sophomore Danny Powers each shot 39 for the Bulldogs, who qualified for the state tournament with the win. Junior Jackson Maffeo added a 39 and Jack Goyetch shot 41 for Canton. Sharon’s Jordan Chabot shot a team-low 39. Taunton, 200 @ King Philip, 203 – Final – After being tied at 159 through four cards, the match was decided on the fifth card with Taunton edging KP by three strokes. Mario Wilson and Kaynel Gonsalves each shot 39 for Taunton while Justin Proto shot a 40. For King Philip, Mickey Riley was the match medalist with a 37 and sophomore Danny McLoughlin added a 38. Oliver Ames, 158 @ Attleboro, 175 – Final – Steven Tasho and Brian Lambert each carded a 39 to lead the Tigers to a win. Tyler Letendre shot a 40 for Attleboro. Milford,1 @ Canton, 2 – Final – Canton scored inside the first 10 minutes of each half while Milford scored in the final minute. Ben Waterhouse and Sam Papakonstantino scored for the Bulldogs while Andre Oliveira scored for the Scarlet Hawks. Stoughton, 1 @ Foxboro, 6 – Final – Foxboro sophomore Joe Morrison scored once in the first half and then twice in the second half and also added an assist for the Warriors. Senior Devante Teixeira scored once and assisted on four goals while Hussein Kafel and Mike Moses each scored second half goals. Stoughton’s Jordan Asnes scored the Black Knights’ lone goal off an assist from Loubensky Lucas. Franklin, 4 @ Taunton, 1 – Final – David Stowell scored a pair of goals, Austin Kent scored once and had an assist and Farley Asmath netted Franklin’s other goal as the Panthers snapped a two-game skid. Mansfield, 3 @ North Attleboro, 0 – Final – Senior Chris Elsner set up classmate Brad Eames for what turned into the game winner in the 26th minute. Less than 10 minutes later, junior Max Gurnon set up senior Charlie Rogers to double the Hornets’ lead. Sophomore Sean Lanzillo capped the scoring in the 54th minute off an assist from classmate Sam Hyland. Junior Evan Christo made his varsity debut in goal and made five saves for the shutout. Oliver Ames, 1 @ Sharon, 0 – Final – OA’s Chris Romero scored the lone goal of the game in the 38th minute. Andrew Fillipkowski made nine saves for the Eagles, five in the first half alone. OA goalie Jack Carroll made three saves, including a sliding block on Sonny Somdah when he was clean through with 12 minutes remaining. King Philip, 2 @ Attleboro, 0 – Final – Maddie Smith smith scored twice in the second half for the Warriors, converted on a through ball in the 59th minute and then again on a corner kick in the 80th minute. Attleboro head coach Steve Santos said Paige Medeiros and Cassie Vivar both played a great game and goalie Madison Brown had a couple of big saves to keep the game level in the first half. Milford, 1 @ Canton, 2 – Final – Milford’s lone goal was scored by Kristen Franzini off an assist from Katie Brown. Milford head coach Jay Mastaj said midfielders Maggie Boyle and Francesca Shipperd both played well. Foxboro, 2 @ Stoughton, 0 – Final – Lily Sykes and Hailey Maling each scored once for the Warriors while Jalissa Allen picked up the win in goal. Taunton, 0 @ Franklin, 3 – Final – The game was scoreless into the final 20 minutes. Freshman Halle Atkinson broke the deadlock off an assist by Bailey Knous. Atkinson then assisted on a goal by Jess Kroushl. Alexis Stowell wrapped up the scoring off an assist from Victoria Stowell. North Attleboro, 0 @ Mansfield, 2 – Final – Lindsay Dalton and Jackie Carchedi scored first half goals for the Hornets. Emily Gaumond recorded the clean sheet. Sharon, 0 @ Oliver Ames, 9 – Final – Oliver Ames junior Francesca Calabraro netted a first half hat trick and classmate Lauren Wright added a pair of goals in the opening half. Kiana Lozzi, Sam Bamford, Annabella Walsh and Abby Reardon each scored once for the Tigers. Attleboro, 0 @ Taunton, 3 – Final – Taunton picked up a 25-11, 25-15, 25-12 win over Attleboro. Tatum Speicher led the Tigers with 30 assists, three kills and an ace, Emily Moor led Taunton with 11 kills while Amy Kistner added 10 kills and four aces. Canton, 3 @ Oliver Ames, 0 – Final – Canton picked up its second straight win with a 25-22, 25-13, 25-15 win over OA. Elizabeth Hamilton had 12 kills, 10 digs and two aces and Sarah Reissfelder had nine kills. Head coach Pat Cawley said Olivia Devoe, Erika Lum and Kehla Minkin played great defense. Foxboro, 0 @ Milford, 3 – Final – Milford picked up its second sweep in as many days with a 25-16, 25-17, 25-11 win. Jill Powers led the Scarlet Hawks with 12 kills, Kara Halpin added eight kills and Kayla Antonellis and Kelley Reichert each had seven kills. Lauren Zouranjian had 35 assists in the win. King Philip, 3 @ North Attleboro, 2 – Final – King Philip battled back from five points down in the fourth game (26-24) to force a fifth game, a set in which they dominated (15-1). King Philip won 17-25, 25-13, 16-25, 26-24, 15-1. In the fifth set, Gwen Uyrus had 13 straight service points, including six aces to give the Warriors the big boost. Emma Lopez had five aces and three kills, Josie Rowean finished with 20 kills and Molly Citarell had six digs for KP. Sharon, 0 @ Stoughton, 3 – Final – Stoughton picked up its first sweep of the season with a 25-17, 25-22, 25-10 win over Sharon. Stoughton sophomore Val Whalen had five blocks, seven kills, five digs and six service points, Ariana Riske added 11 digs and 12 service points and Ava Siegel had 10 digs and 11 service points. Attleboro, 2 @ King Philip, 2 – Final – Attleboro and King Philip went into halftime tied 1-1 and finished in a deadlock when the final whistle blew. Emily Houle scored in the first half for Attleboro before KP tied it up off a corner by Courtney Foley on an assist from Casie Curtin. Grace Mayer scored off a penalty stroke in the second half to put the Bombardiers back ahead but a goal by Caitlin Donahue, assisted by Liz Furfari, knotted the game again. Canton, 2 @ Milford, 2 – Final – Canton took a 1-0 lead into halftime but Milford battled back twice, scoring its first ever goals against the Bulldogs since joining the Hockomock League. Nicole Fokas tied things up off an assist from Jessica Palmer. Canton went up again but a goal from Shannon Cormier leveled things again. Mansfield, 4 @ North Attleboro, 2 – Final – Emily Ierardo scored a pair of goals for the Hornets while Brianna Puccia and Julia Todesco each netted a goal for Mansfield. Oliver Ames, 6 @ Sharon, 1 – Final – Senior Nicole Walker scored four goals to lead Oliver Ames while senior Olivia Powers had three assists in the win. Attleboro, 26 @ North Attleboro, 29 – Final – Attleboro junior David Seybert finished first with a time of 16:19 to pace the Bombardiers. Franklin, 21 @ King Philip, 37 – Final – Franklin’s Ryan Spelman finished in 17:17 to take the top spot and pace the Panthers. Jimmy Robbins (17:22) and Nicholas Gnaman (17:28) finished third and fourth while Jeff Wu (17:52) finished sixth, Evan St. Germaine (17:54) finished seventh and Tyler Marchioni (18:03) finished eighth. King Philip’s Seth Sullivan (17:20) finished second and Brendan Sullivan (17:29) finished fifth. Mansfield, 18 @ Taunton, 39 – Final – Mansfield’s Jake Affanato (16:48), Nick Rispoli (16:49) and Kevin Crawford (16:54) took the top three spots. Taunton’s top finish was senior Trevor Wysong, who finished fourth at 16:54. Franklin, 23 @ King Philip, 34 – Final – Franklin’s Brittany Robinson and Nicole Clermont finished first and second to pace the Panthers while Katherine Hartnett (19:55) finished fourth. 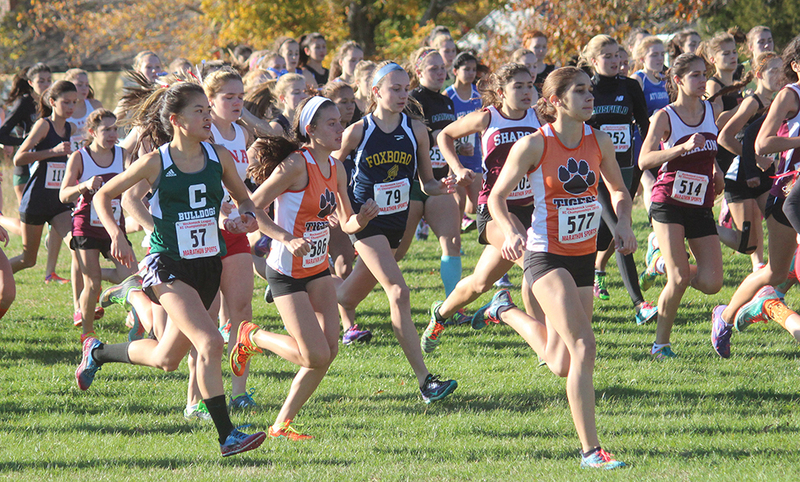 KP’s Erin Quinn (19:53) finished third, Nina Sitarski (20:18) was fifth and Erica Layna (20:52) finished sixth. Mansfield, 25 @ Taunton, 32 – Final – Mansfield junior Julie Romano won the race in 20:30 while freshman Megan MacVicar finished fourth (22:40), junior Kerrin McCarthy (23:07) finished fifth and senior Gianna Madonna-Lendvai finished six (23:13). Taunton’s Amanda Baptiste (20:46) finished second and Kailey Melito-Santos (21:25) finished third overall. Canton, 157 @ Stoughton, 179 – Final – Canton sophomore Jack Goyetch shot an even part 36 to lead the Bulldogs to their sixth straight win. Senior Griffin Jerrier carded a 38 and senior Steve Gorham shot a 41 for Canton. Stoughton’s Josh Roos shot a team-low 43 for the Black Knights. Mansfield, 171 @ Taunton, 170 – Final – Taunton edged Kelley-Rex rival Mansfield by a stroke. Mario Wilson shot a 39 and Justin Proto carded a 42 for the Tigers. Sharon, 229 @ Foxboro, 232 – Final – The match was tied at 182 through four cards and Sharon took the when their fifth score was a 47 compared to Foxboro’s 50.